IT WAS the frightening climax to an intimidating match, played in the most hostile atmosphere. No sooner had the final whistle sounded at the Stadio Olimpico than some of the capacity crowd were on the pitch, Francesco Graziani – wearing only his black underpants – was swirling a shirt above his head and a group of his Roma team-mates, eyes burning with hatred, were sprinting for the touchline to seek out Jim McLean, the Dundee United manager. Suddenly, the security guards that had been with United were nowhere to be seen and McLean found himself surrounded by a mob of threatening Italians, including Franco Tancredi, the Roma goalkeeper, and Agostino Di Bartolomei, their captain and playmaker. Visibly shaken by a barrage of verbal and physical abuse, McLean somehow withheld the response that would have caused a riot. Maybe it was something to do with the 2-0 defeat his team had inflicted on them in the first leg of their European Cup semi-final tie in Dundee. With the final to be held in Roma’s own stadium a few weeks later, the prospect of missing out at the hands of a two-bit, cornershop club from the east of Scotland did not bear thinking about. McLean, more than anyone, was responsible for taking them to the brink of that indignity. Roma were scared, and sometimes, when people are scared, they take leave of their senses. As the 30th anniversary of that semi-final approaches, all associated with United will reflect on it with a mixture of awe and anger. Awe that a side of United’s stature came so close to a showpiece final against Liverpool. Anger that they were treated so disgracefully by one of the powerhouses of European football. Had it only been about United’s exploits on the pitch, the story would have been compelling enough. That they, a provincial club with a 14-strong first-team squad, had won the league in 1983 was a miracle. That aggregate wins against Hamrun Spartans, Standard Liege and Rapid Vienna the following season should carry them into the last four of the world’s biggest club competition almost defied belief. In the press conference afterwards, it was suggested that United must have been on something. 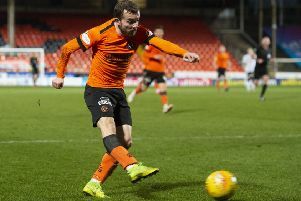 “Well, whatever it was, we’ll be using it in the second leg,” was the gist of McLean’s flippant response, which turned out to be the catalyst for the controversy that followed. The Italian media seized on his remark. Some said that McLean had called the Roma players “Italian bastards”. Others suggested that he had been cocky about his team’s prospects in the return. That nobody can quite put their finger on what McLean is supposed to have done wrong left many to conclude that it was an orchestrated campaign, constructed on the flimsiest of evidence, to make the second leg as uncomfortable as possible for United. In Italy, United fell victim to every trick in the book. The kick-off on April 25 was scheduled for 3.30 in the afternoon, when Rome was at its hottest. Their hotel was teeming with security men, whose dogs were allowed to bark 24 hours a day. The night before the match, motorbikes gathered outside to peep their horns and rev up their engines. When the Scottish players used the lift, they were greeted by a gun-toting policeman. Plumes of smoke filled the air as a fevered crowd – bringing record gate receipts of more than half a million pounds – laid out the welcome mat. “God curse Dundee United” read one banner. “McLean F*** off” was the message on another. “The players were hyped up, the crowd were hyped up ... it really was over the top,” says Gardiner. Goodness knows what the reaction would have been had Ralph Milne not slashed an early chance over the bar. It was to be a costly miss as two first-half goals by Roberto Pruzzi, and Di Bartolomei’s penalty, turned the tie on its head. For those in Scotland, who were watching on television, the only consolation was a technical hitch that interrupted the live feed. Early in the game, the broadcast briefly gave way to a snowy picture from which there emerged a snooker match between Jimmy White and Rex Harrison. Maybe, but the revelation, two years later, that Roma had tried to bribe the referee, Michel Vautrot, only compounded United’s sense of injustice. The Italian club were suspended from European football for a season, and their chairman, Dino Viola, was banned from official UEFA activities for four years. The referee maintained that he never received the £50,000 – some claimed that the middleman did a runner with the money – but in 2011, Riccardo Viola, the chairman’s son, shed new light on the mystery. He told of a dinner on the eve of the match, when Vautrot was alleged to have informed them, in coded language, that the deal had been done. For Sturrock, Kirkwood, Bannon and all those who took United almost to the summit of European football, only to be punched, spat on and accused of taking drugs, further evidence of foul play was the final insult. Last month, Sturrock wrote to Michel Platini, asking the president of UEFA to consider taking retrospective action. The Scot, who would go on to manage United, as well as a host of other clubs, has since received a reply in which he is assured that the governing body will look into it. Of all the tales to emerge from this sorry episode of European football history, perhaps the most disturbing was to come almost a decade later. On the tenth anniversary of the final against Liverpool, Di Bartolomei walked on to the balcony of his villa in San Marco di Castellabate and shot himself through the heart. In his suicide note, he referred to financial problems, a loan that had been refused, but the date of his death cannot have been a coincidence.